But what about the consequences of premature withdrawal??? from an adolescent! While I’m snapping pictures of the children who are really in danger in our country, a young white man approaches me with the swagger and boldness of a very insecure, very angry entitled male. He’s angry that I am protesting. He tells me I haven’t considered the consequences of withdrawing prematurely from Iraq. I ask what he imagines those consequences will be. He claims Iraq is on the brink of a civil war – and our troops are the peacekeepers in the district. I don’t tell him he’s on last year’s propaganda page. Instead, I inform him that both Bush and Cheney have admitted there is a civil war happening right now. I tell him the same lies that got us into Iraq are the lies that are used to keep us in Iraq. I ask him if he remembers the first three years of the occupation of Iraq. He tells me he was 12 and he remembers clearly. I tell him then he probably clearly remembers how Bush said we couldn’t pull our troops out because there would be a civil war if we left. I point out how convenient this ‘lie’ was for all the caring people of this country who didn’t want to see a civil war there. The I tell him how it is official now, there is a civil war in Iraq and the ‘lies’ we’re being told now is that we cannot leave Iraq because there is a civil war going on. He patiently explains to me that America is a world POWER; how we have an obligation to ‘stabilize’ the region. And we have to prevent them from using a nuclear bomb – he rants about nuclear bombs. I ask him if he’s thought about why the region is ‘unstable’ in the first place? I can see in his eyes that he understands. Then he remembers Saddam. But I have to address the nuclear threat. Here is where I get to ask him about all the countries in the world that have actually dropped nuclear weapons. He can’t think of any. I get to ask, if there are countries who have used nuclear weapons in the past and countries who haven’t, which countries does he think would be most likely to use them again? He brings up his ace in the whole: Hitler – and what if we never fought Hitler. I get to talk to him about what really went down during World War II, about all the opportunities we had, the German people had, everyone had to intervene before the only option (those people leading the country could fathom) was war. I ask him to think about all the corporations and men that are getting VERY rich off this war; and all the poor men that are dying so these men can get very rich. He doesn’t want to think about this. I ask him if he is in danger of being recruited. He blushes so deeply I check to see if my teeth have fallen out or my buttons popped! He mumbles he has to go but I grab his arm, tell him how much I’ve appreciated talking with him and then I tell him “Do NOT go, son” as I press the GI rights hot-line card into his hand. 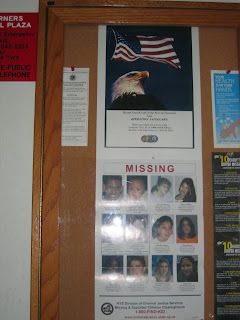 I had to return to the service area to take pictures of these posters hanging just inside the 'beautiful' modern, all glass, steel, marble building that houses the bathrooms, restaurants, and information center for travelers on the Mass Pike. These two posters hang together, one perched above, the other below. 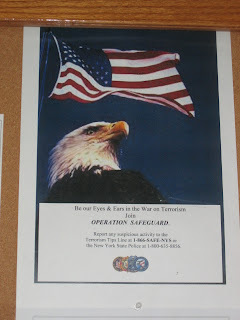 The eagle and flag jump straight into the 'patriotic' heart along with the wretched words striking fear and pride: Operation Safeguard! Be the eyes and ears in the war on terrorism!!!! 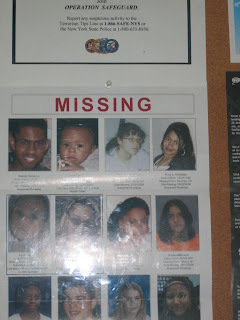 Then beneath hangs snapshots of mostly female, mostly brown and black, mostly very young womyn/girls that are missing, lost, in danger of not making it to their 16th birthday.